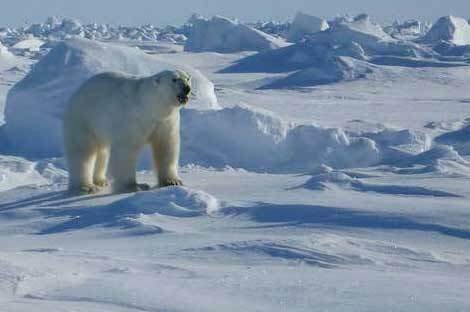 Alaska is known for its wildlife — including dangerous animals like polar bears. Officials are using Tasers in certain threatening situations. You never know what fool will pick up a stun gun and decide to "Tase-and-release" a wild animal with it. That's why Alaska decided to act before the scenario unfolded: Starting July 1 it will be illegal to do just that. But, seriously, would anyone — even a fool — try? "We have not had any calls, questions, or contacts from sportsmen, legislators, or other leaders regarding this topic," says Doug Jeannert, a spokesman for the U.S. Sportsmen's Alliance. "This seems like a solution in search of a problem, so we have not taken any position as this appears to be a non-issue." The animal rights group PETA hasn't heard of anyone trying it, either, but doesn't put it past some. "There are all kinds of cruelties out there," says Martin Mersereau, PETA's director of emergency response. For Alaska's Department of Fish and Game, the decision was all about being proactive, says Larry Lewis, the agency's expert on Tasers and wildlife. "An analogy was the computer-generated killing of animals that was taking place in some parts of the United States for sport where a person was able to use a computer to sight in on an animal within a high fence and push a button to send a bullet into the animal killing it," he says. "That use of modern technology was unforeseen by many state agencies and quick action had to take place to regulate or outlaw the use of that." The fine and/or penalty for violating the Alaska ban has yet to be enacted. But in any case it does not make it illegal to use stun guns as defensive weapons if someone feels threatened by wildlife. Moreover, Alaska wildlife officials intend to continue using Tasers in certain wildlife management situations, and the company that makes the devices last March came out with a model just for those professionals. Anyone buying the X3W wildlife Taser "must attend and become certified with the use of the devices in wildlife-specific TASER training class," emphasizes Andrew Hinz, director of medical and technical programs at TASER International. Several wildlife agencies have contacted TASER about the devices, he adds, noting that more than 20 were sold within the first month. Alaska was also the first state to use Tasers for wildlife management — thanks in large part to Lewis, who had what he calls "an epiphany" in 2005 while confronted by an angry moose. Lewis, whose job title is wildlife technician, tried noisemakers and rubber shotgun pellets while trying to free two moose calves trapped in a pit, only to have their mother chase him and a trooper three times around a patrol car. Instead of using their handguns, the trooper pulled out his Taser and it actually worked well enough on the mom to temporarily scare her away. The men rescued the calves and reunited them with the mom. 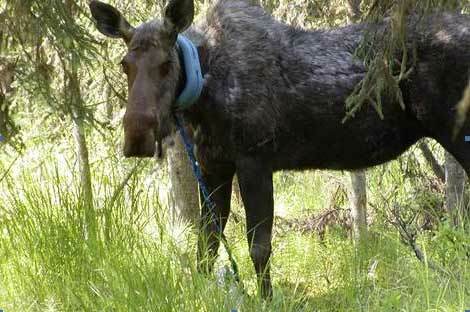 This moose managed to get a child's swing seat around its neck back in 2009, before Tasers were used in Alaska. Wildlife officials there say they periodically come across situations where a Taser could be used to help wild animals. The moose here was tranquilized with a dart, a technique that can have drug-related drawbacks. Since then, Alaska's wildlife agency and TASER have studied the effects of Tasers on moose, taking blood samples and looking at stress levels. Those tests show the moose recovering almost immediately from a Taser exposure, compared with a much longer recovery after a tranquilizer. They've also found that wild animals hit with Tasers and allowed an escape route have not responded aggressively, but instead have fled. That was the case with several brown bears who were zapped at a dump sites. They did later return but showed a greater awareness of and aversion to humans. Lewis' periodic use of his Taser includes the time a moose had a chicken feeder stuck on its head. The moose was immobilized long enough for a wildlife biologist to pull the feeder off — all without having to drug the animal. PETA, for its part, isn't opposed to wildlife experts using stun guns in certain cases, and agrees it's less stressful on animals than a tranquilizer dart. Stun guns "do cause uncontrollable muscle contractions and pain," says Mersereau, but "it can be the most humane alternative" if an animal's life is threatened and it needs to be immobilized. As for the public using stun guns for self-defense, Mersereau says that "if it's life or death, then by all means" use it. But he adds that in many cases those confrontations can be avoided by making noise to avoid contact, and by animal-proofing food supplies and dumpsters. Lewis emphasizes that stun guns are "not a cure-all or a panacea" for wildlife officials. But, he adds, "there are many instances of wildlife professionals using every tool they have available at the time of the incident and then having to escalate to the use of deadly force ... This is one more tool that may be used prior to lethal force in some situations."